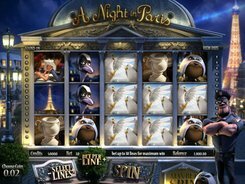 A Night in Paris pokie by BetSoft. Review, free game and bonuses. Tempting offer to spend a night in Paris is something that you can agree on in A Night in Paris pokie. Modern 3D-graphics in conjunction with HQ sound create the atmosphere of full immersion, pushing the gaming experience to the next level. The betting range comes with favorable conditions for newbies and high rollers: you can bet from 2 cents to 5 dollars. Keep on spinning and forming croissant, the Eiffel Tower, pigeons, police badge, a loving couple, a thief and cop symbols into winning combinations. The latter, by the way, is the combination you’ll certainly want to hit as it brings 7,500 coins right away. Three police signs take you straight to the casino for a win-win game round. Catch a robber chase and get one more prize to your record. Another bonus game is also about seizing the criminals: if you catch a thief in the museum you’ll get generously rewarded.